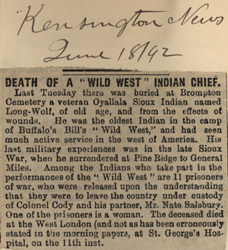 DEATH OF A "WILD WEST" INDIAN CHIEF. Last Tuesday there was buried at Brompton Cemetery a veteran Oyallala Sioux Indian named Long-Wolf, of old age, and from the effects of wounds. He was the oldest Indian in the camp of Buffalo Bill's "Wild West," and had seen much active service in the west of America. 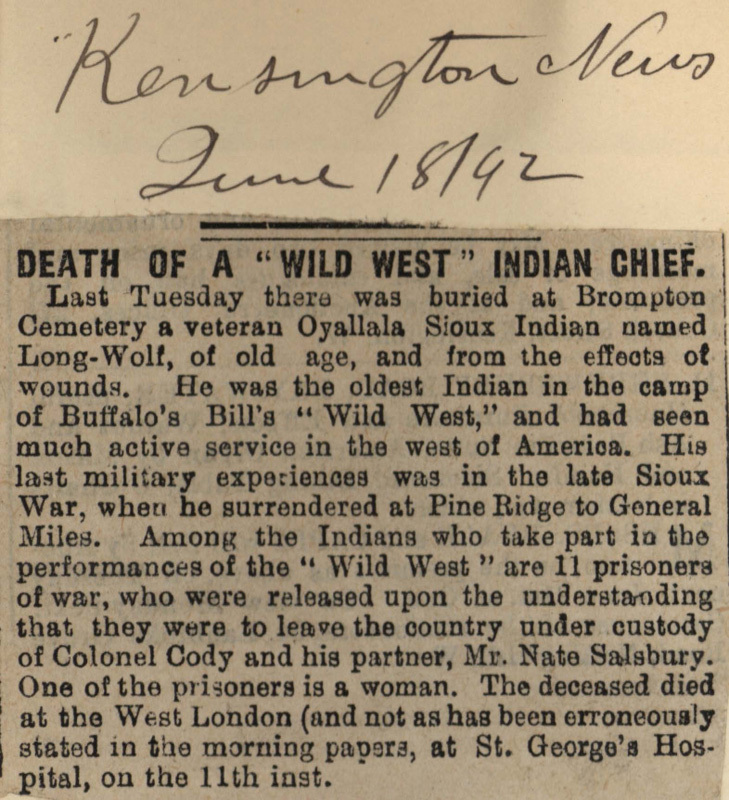 His last military experiences was in the late Sioux War, when he surrendered at Pine Ridge to General Miles. Among the Indians who take part in the performances of the "Wild West" are 11 prisoners of war, who were released upon the understanding that they were to leave the country under custody of Colonel Cody and his partner, Mr. Nate Salsbury. One of the prisoners is a woman. The deceased died at the West London (and not as has been erroneously stated in the morning papers, at St. George's Hospital, on the 11th inst.